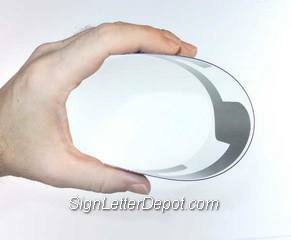 Minimum quantity for "White Sign Letter Track for Portable Sign Letters" is 5. White Polycarbonate Letter Track - "Texas Track" is used to hold .030 mil flexible plastic sign letters on the sign board. 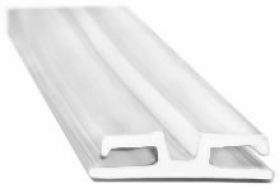 This is the same track as our clear Flex-Change letter track except this tracks made using white polycarbonate plastic. The white track looks very good against a white substrate or sign panel and is ideal for making sidewalk signs and portable roadside signs. Each strip is 8' or 96 inches and can easly be cut to fit your sign panel. Attach by using rivets or screws. Double sided tape can be used to attach to Coroplast or corrugated plastic. When using double sided foam tape the color of the tape will show through clear track. 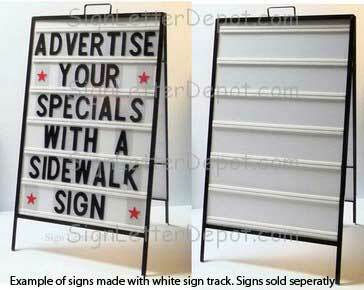 With white track the color of the track will match the white background of your sign panel. Flex letter track is used with Flex Letters. Flex letters will not hold suction using a letter change pole. Telescoping Letter Changer arms are used for overhead signs with "Push Up Drop Down Track" which use Rigid, Pronto or Zip Letters. Choose Push Up Drop Down Track and Rigid, Pronto or Zip Letters If you want to make an overhead sign and use a letter change pole to change the letters.